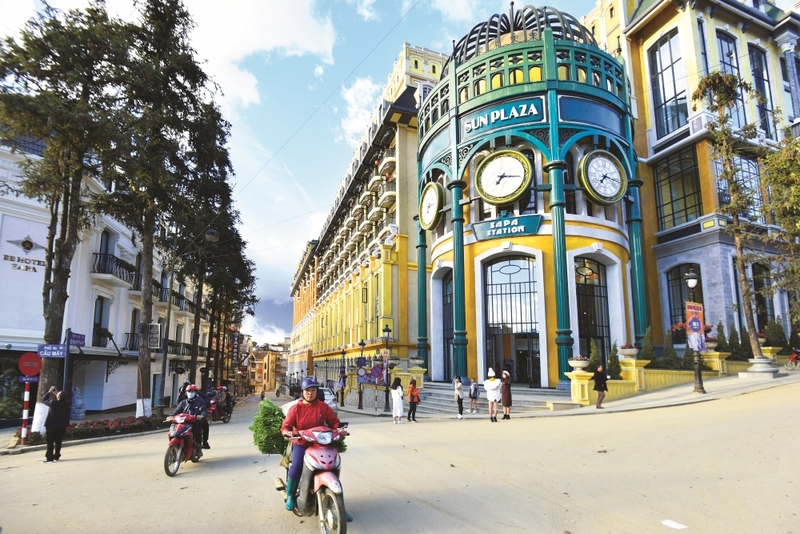 (VEN) - The town of Sa Pa in the northern mountainous province of Lao Cai has seen an increasing number of tourists and growing investment since Prime Minister Nguyen Xuan Phuc signed a decision in late 2017 recognizing the resort town as a national tourism site. Sa Pa is famous for its dramatic scenery of valleys and mountain peaks, such as Fansipan Mountain, Muong Hoa Valley, Ham Rong Mountain, and Ta Phin Village, and the diversity of ethnic minority groups who live there, including the Kinh, Hmong, Yao, Tay, Day, Xa Pho and Hoa. Lao Cai Province is also a gateway to China’s Yunnan Province, boosting its advantages as a tourist center. Thanks to sustainable development policies, given the growth of tourists, Sa Pa is expected to welcome about four million visitors by 2020 and eight million by 2030. To meet tourism development demands, Sa Pa has been engaged in massive infrastructure construction, such as a road connecting Noi Bai-Lao Cai Highway with the town, and the Quang Ninh-Hai Phong-Sa Pa route. Lao Cai has also proposed to the Ministry of Transport the construction of an airport in Sa Pa, opening up opportunities to further attract tourists. A series of key projects are also being implemented, including a new administrative center, a high-class service complex, a Muong Hoa cultural park, and a new urban area in northeastern Sa Pa.
Lao Cai Province is attracting large real estate investors, such as Bitexco, Sun Group, Vingroup, and Truong Giang Sa Pa Group interested in developing high-end resort complexes. In December, the first international five-star hotel opened in Sa Pa. The 250-room Hotel de la Coupole - MGallery by Sofitel bills itself as restoring Sa Pa back to its heyday as a retreat for French emigres sojourning in what they called the Tonkinese Alps. mountain air, dense forests, vast paddy fields and an opportunity to experience ethnic culture.